The collective culture’s fascination with David Bowie seems to deepen with each passing year. The performer has evolved beyond the point of celebrity, becoming more of a modern legend. This is amplified by the fact that due to the longevity of his career, he has amassed fans of multiple generations, requiring many (if not most) to dig and to explore his repertoire beyond their point of entry. And while it seems easy enough to research his past performances and personae, listen to his discography, and find interviews, there is still a hunger for more. In our modern age of social media in which celebrities can and often interact with their audiences directly, it seems bizarre that anyone could have such mythos, especially a living performer. There is an inherent need to humanize him. 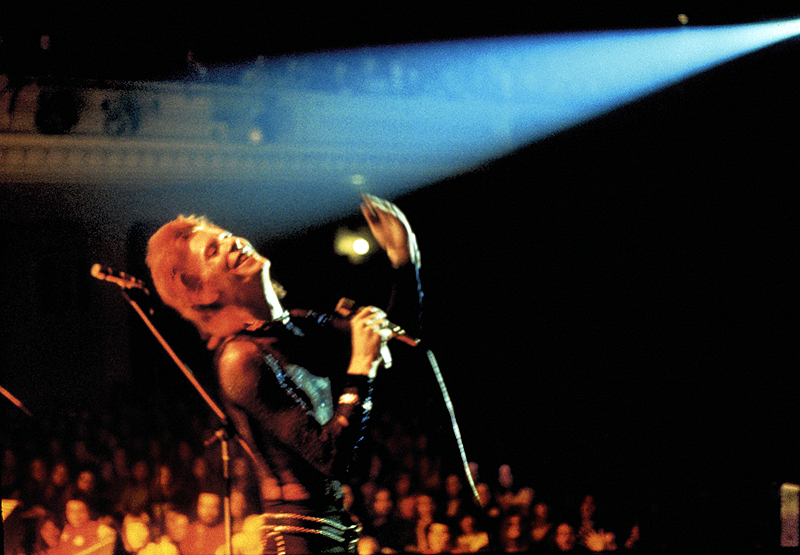 Enter Mick Rock, the man who captured Ziggy Stardust both on and off stage. One could say the man is steeped in music's history, although that feels incorrect. He captured music history with his photos, and he also made music history, directing early music videos (including the one for “Space Oddity”), and creating iconic albums covers such as Queen’s Queen II and Joan Jett’s I Love Rock ‘n Roll. This month saw the release of Rock’s book The Rise of David Bowie: 1972–1973, which (as the title suggests) is a collection of images from Bowie’s tour for his album The Rise and Fall of Ziggy Stardust and the Spiders from Mars. Additionally, an exhibition opens this week at Taschen’s gallery in L.A. Mick Rock: Shooting for Stardust, The Rise of David Bowie & Co., which will run until October 11th. If there is anyone with answers as to how Bowie has evolved, it’s the man who was there with him, living on the other side of the lens. I’ve gotten a chance to go through the book, and some of the pictures are really iconic, but there are others that people probably haven’t seen. MR There’s a lot of stuff in there, specific frames that have not ever been published anywhere before. That was very much a part of the idea with David: the book has got to have a load of previously unseen pictures. ‘Cause we did a beautiful, very different-looking book in 2002 of my pictures of David, and it was another co-sign book. Could you tell that this was going to be a jumping off point for both you, as a photographer, and for him? MR It was a different universe then. It was very existential, in the moment. David clearly had a very sharp focus and an unusual one for the times. There was not really any precedent. Even for bands like the Beatles and the Stones, who we all—meaning me, Lou Reed, Iggy [Pop], David, even Freddie [Mercury] of Queen—regarded as being kind of old hat at that point. Nobody thought this game was going to keep going. I mean, it was strictly a youth phenomenon, and people over 30 were kind of frowned upon just because of their birth dates. I was doing what I was doing ’cause I enjoyed it. The idea of Mick Jagger going out at 72 and still performing was regarded as being almost prehistoric. I mean, Elvis Presley was regarded as being dead in the water, and that was really only ’72, 16 years after he released his first record. The idea that these photos of mine are in museums and cultural centers, and art galleries all over the world nowadays…again, that would have been like a drugged-out idea at the time. You’ve been shooting for decades; what’s it like to follow musicians over the years, and how has it changed? MR Well, initially they weren’t so visually conscious. David was, and that made him the exception of the time. Marc Bolan had been around. He was, I always say, John the Baptist, and David Bowie was the Jesus Christ of glam rock, then. I’ve had my ups and downs, my crazy years, and the years of being broke, the 20 years of a cocaine habit, which didn’t end ‘til 1996 when I had heart bypass surgery. It was a very experimental period. And of course the LSD, as much as anything, had a lot to do with it. Steve Jobs talked about LSD and meditation, and Apple probably wouldn’t have happened if he hadn’t taken it. And certainly if I hadn’t taken LSD I wouldn’t have been a photographer. It’s a lot to absorb in one gulp. What was it like to be on the road with these musicians? Have you even gone on to spend such an intimate amount of time with anyone else? MR No, you’ve got to remember how young we all were. And of course we’re all around the same age, give or take three, four, five years. It’s a little different today. I have a different kind of relationship and I wouldn’t have the time to go on the road. People couldn’t really afford me in this day and age and I don’t really want to go and hang out with a lot of older musicians. I’m happy to shoot them now and again, but I don’t really need to spend that amount of intense, intimate time. Back in those early days I took pictures, got a little stoned maybe, or hung out with young ladies of my own age. I like constant novelty, anyway. That’s part of my drive. It wouldn’t have the same excitement for me, I don’t think, you know? What I really like to do nowadays, for the most part, is choreograph a session. Build the energy, focus it, and stir all the juices. Rather than just act like a photojournalist, as it were. Although I know a lot of my famous pictures are of that nature. But today it’s a different world, and it’s a more controlled world, too. So, nobody thought about the implications of the photographs I took at that time. Why do you think it is a good time for this book? MR I think the timing probably is very good with his museum show touring the world. He’s been elevated to a kind of high art nowadays—in himself, his work, and his costuming. No one’s had, from the rock and roll game, a worldwide touring exhibition like that. Taschen tells me it’s probably one of their fastest selling books ever. I think their other big book at the moment is Andy Warhol: Polaroids, which is a cool book. What’s one thing that people get wrong about David? MR I’m sure they get many, many, many things wrong about David. He’s very tricky to tie down. He definitely moves in mysterious ways. I don’t want to go into certain areas, although I could say he’s had a lot of girlfriends, I’ll tell you that. I really haven’t seen him in quite a while, we do it all by email. He’s a very cool human being. He’s a very fertile artist, although for me to say that probably isn’t very surprising. I deliberately do not talk too intimately about other people’s lives—just as a matter of respect. I’ve been very fortunate, from quite an early age, to have been around some amazingly creative people. And the fact that I can hang out one afternoon in L.A. with Skrillex, and this young lady called CL…have you heard of her? They have that song, “Dr. Pepper”? MR She’s been showing up at some shows that Skrillex and Diplo have been doing. In fact, they’re making records with her. Beautiful young lady, extremely disciplined, and she will be a big deal here. I can guarantee it ’cause those two will make it so. This collaborative thing is fascinating. I don’t know when it was that David and Queen made “Under Pressure,” but that was a very unusual move, and then I don’t recall much of it in the '70s or the '80s. What’s something that you have not photographed, and that you would like to? MR Well that’s an interesting tale, too, isn’t it? I would like to photograph the “Uptown Funk”—what’s his name? What was it like to switch from film to a digital camera? MR It took a moment or two, and for a while I was shooting both. I like the fact that all the work of mine—from the '70s and the '80s especially, the people are interested in, it’s obviously the most valuable part of my collection—is the fact that it is on film, and that you do have a true master. I mean, whatever I shoot nowadays would never have the value of that early stuff because these personalities are shot by so many photographers today, whereas back then I was the only one taking the pictures. David wasn’t particularly successful when we met, neither was Lou [Reed], Iggy, Queen, nor Roxy Music. I mean it wasn’t that I was making much money off it. You didn’t need to make much money. I don’t know how young photographers do it today. Do you think that there will ever be a personality that captures the public’s attention the way that Bowie did, or the way that Freddie Mercury did? MR That’s an interesting question, and I don’t quite know, because change happens all the time and I hesitate to say “no.” Back in those days there was time for artists to gestate, to grow. David released his first album I believe in 1967. Ziggy didn’t come along until ’72, and he’d had a number of failed albums. The first two Stooges albums were regarded as being complete duds, as were all the Velvet Underground albums. The public’s attention shifts so fast [now]. You can get over-exposed in about 10 minutes. I don’t know if young modern audiences care about any of that. They just want new things, all the time. There’s this great big machine out there called the Internet, and it needs to be constantly fed. There was nothing like that. Different world, different times, different league, different technology.